thing is for sure, it must have been one heck of a shock to the system! 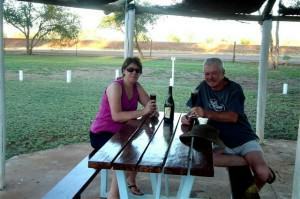 We passed the Tropic of Capricorn marker about 30 kilometres (19 miles) north of Alice Springs and then stopped at the Barrow Creek Roadhouse for lunch; the temperature had climbed both inside and outside the car and it was good to let it have a rest. Barrow Creek was an important point of the Overland Telegraph Line and the Telegraph Station, built in 1872, is still standing today. Of course these days Barrow Creek is more famous, or infamous, as the site if the disappear­ance of British backpacker Peter Falconio in 2001. Finally, after 308 kilometres (236 miles) and several hours on the road, we arrived at the Wycliffe Well Roadhouse Caravan Park ([star][star][star][star_half]). To say we were impressed is definitely an understatement. 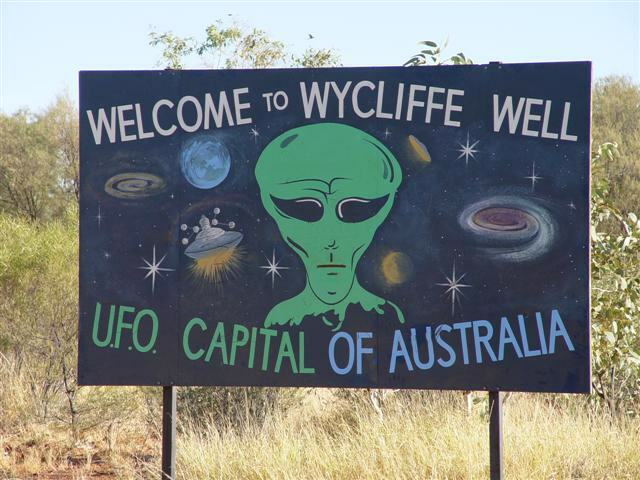 Since World War II there have been countless sightings of strange things in the sky here at Wycliffe Well and in fact the area has such a reputation for the unexplained that even the Royal Australian Air Force has conducted investigations. 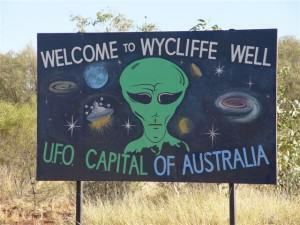 The owner of the park has capitalised on those sightings and turned Wycliffe Well into the UFO capital of Australia. Interesting amenities for Maliens and Femaliens! 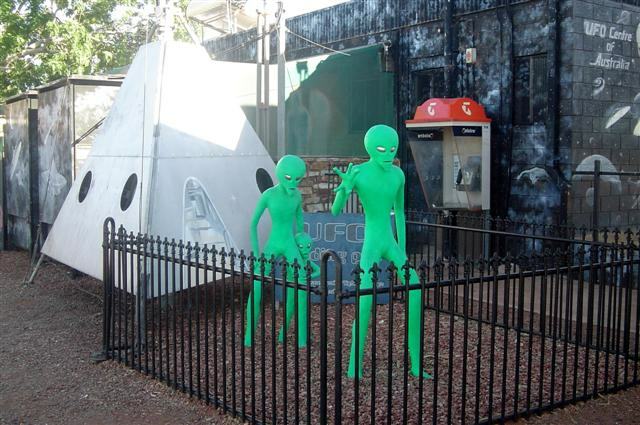 Everything about the park is UFO-oriented, from the sign warning that you are entering a UFO landing site to the green aliens that greet you at the front of the park, and the amazing murals on every wall. 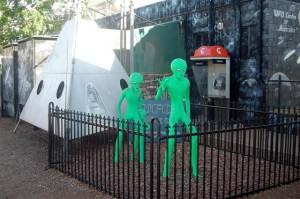 There is UFO or space-themed things around the whole park, even in the swimming pool with its paintings of aliens on the pool bottom, and the amenities for “Maliens” and “Femaliens”. The park has a licensed restaurant in the Galaxy Auditorium and Lake Wycliffe, a lake covering 4 hectares (10 acres) was under construction during our visit. When completed the lake would hold 150 million litres (32 million gallons) of water and will be well stocked with fish and red claw crabs. Enough reason for John to want to come back! 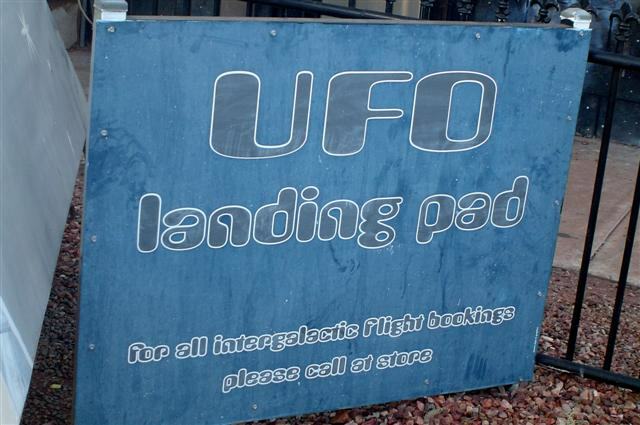 Indulge in a little UFO-spotting! We made good use of the pool that afternoon and the water was refreshingly cold, although not as cold as some we’ve been in, and this evening we sat outside in the surprisingly warm air and toasted our new adventure with a bottle of Two Tails Sparkling Wine. Later that evening we indulged in a little UFO-spotting. I had heard that if you didn’t see something then you were unlucky. Well, between us, all we saw was 4 shooting stars, including one that fairly streaked across the sky. Does that count? Plenty of beer and no UFO’s! The bar here is reputed to have the greatest selection of beers of any bar in the world. That probably has a lot to do with the UFO sightings but, then again, this place is pretty close to Pine Gap, a satellite tracking station and defence research facility operated by the Australian and US governments, and who knows what they get up to there! In any case, by the time we went to bed my sore throat and dripping nose had become a full-blown cold and if any aliens had landed and said “take me to your leader” I probably would have said “yeah, yeah, whatever!” I must admit I was disappointed not to have seen at least a moving light or something. Oh well, there’s always tomorrow night. After a night that was very warm and noticeably devoid of UFO activity we set off early the next morning, before the heat of the day, for the Devil’s Marbles, known as Karlu Karlu in the Aboriginal Dreaming. 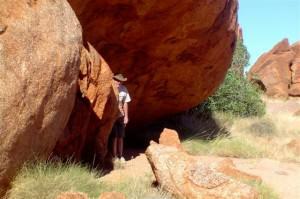 According to the stories from the Dreamtime this is where the Rainbow Serpent laid her eggs. 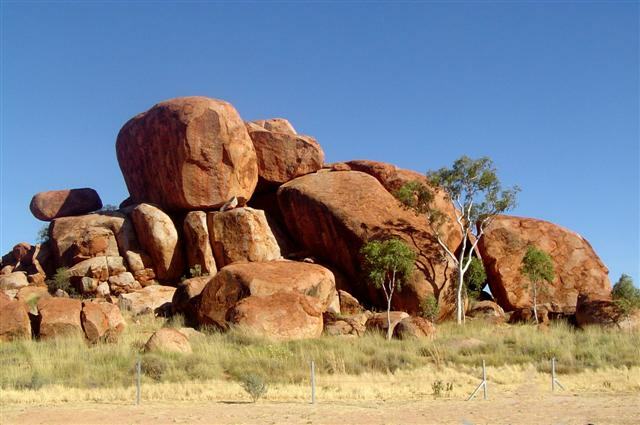 Located 30 kilometres (18 miles) north of Wycliffe Well, this outstanding geological feature consists of granite boulders scattered over the plain. There is a network of walking tracks throughout the marbles and we walked through the boulders totally amazed at the way some of the rocks just balanced on top of each other. It didn’t look like it would take much of a push to have the whole lot tumbling down but these rocks have stood like this for millennia so, truthfully, it would take an awful lot to shift them. The whole area is part of the Davenport Range and in all the literature we’d read not once was there any mention of the mythical “bunyip”. However, I was certain that I saw one; he even posed for a photograph! It was when that “bunyip” asked what was for lunch that I reminded him that we’re not supposed to feed the animals! Karlu Karlu is well known for its diverse range of wildlife, particularly birds and it provides a secure breeding ground for Fairy Martins and Zebra Finches and a lot of different breeds of lizards. The flora in the area includes native Rock Figs. The day was really hot and after we returned to the park John and I went for a swim and later wandered around the wonderfully air-conditioned park office. There are a number of newspaper articles about various UFO sightings covering the walls. We found these really interesting and even for a non-believer some of the stories can’t be explained away as natural phenomenon or man-made. A couple of the stories were weird and some even sent a chill up my spine, especially the one where some people claimed that a strange light chased them along the highway late one night. We had planned to leave before sunrise the next morning but now I was beginning to wonder if that was a good idea! We spent some more time sitting outside in the evening but I guess we just weren’t lucky this time. The sky was enormously beautiful with all the stars in the heavens on show but absolutely nothing was moving up there, no planes, no helicopters, no flying saucers, not even a kite! Nothing, zip, nada! When we left in the wee small hours there was no traffic, Earthly or otherwise, but I made a firm resolve to return one day to this “otherworld” patch of ground they call the UFO Capitol of Australia. And, of course, John wants to fish in that lake.